Last week for my blogging tips series, I wrote about making your own blogging rules. While I do believe in doing things your way, there are various hoops you should be jumping through if you want optimal results. Doing everything your own way could result in missing out on a lot of extra traffic. It could make your blog grow much slower. So this week I’ll be discussing another tactic you should consider using to get the most out of your efforts. 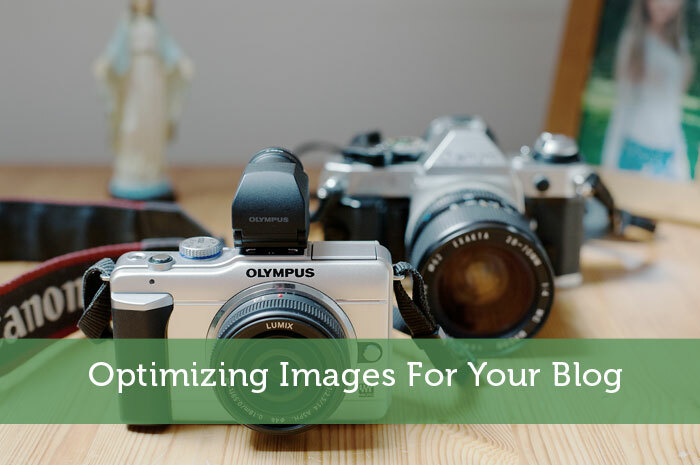 The topic I’ll be discussing today is how to optimize your blog images. This topic was suggested to me by Anne from Unique Gifter. Thanks for the suggestion Anne. If you want to liven up the appearance of your blog, one of the easiest ways is to use quality images in each of your posts. Back in July I wrote about finding free images for your blog. There’s more to it than just adding images to your posts though. To get the most bang for the buck, you should also be optimizing those images. For both your visitors and search engines, it is important that your images are optimized for file size. Visitors don’t want to wait a long time for your blog to load. Meanwhile search engines limit rankings of sites that take too long to load. Personally I manually optimized each image I use with Adobe Photoshop and its ‘Save for Web’ feature. That way I can limit the filesize without affecting how the image looks on a webpage. Other image editors likely have similar capabilities. For a more automated approach you can use a WordPress plugin called WP Smush.it. That plugin will allow you to optimize images on the fly or optimize existing images on your blog. To get the most traffic possible for you blog, you want to leave no stone unturned. One of those stones is optimizing images for specific keywords. To reinforce your post relevance for keywords, you should be naming your images using those specific keywords. For example, in this post I have named the main image optimizing-blog-images.jpg. That shows search engines that your post is especially relevant for those keywords. Your images might even show up in image searches, driving more traffic to your blog. Or on sites like pinterest, those image names can catch people’s eyes. One mistake I see some blogs frequently making is just linking to their images. Instead of downloading the images to their own server, they refer to the image location on another website. This might appear fine on the front-end of your blog, but it can have some negative consequences. First of all, that image might be removed from that other website later, leaving a broken link and missing image on your blog. Secondly, it can slow down the loading of your page which is a bad signal to send to Google. Thirdly, you miss the chance to optimize that image for both filesize and keywords. Of course, make sure the images you are using have the proper copyright restrictions that allow you to publish them on your blog. Even if you use credit links for copyright reserved images, it doesn’t mean you’re not stealing it. While images might not seem important beyond adding some color to your post, remember the benefits of further optimization. Make it part of your posting routine and you’ll be getting more out of your posts. Do you currently optimize the images for your blog? Or is there part of the optimization process that you’re not yet addressing? I sorta struggle with this one too. For pictures I take that are a little blurry, I try to use smaller sizes in posts so the blurriness isn’t as obvious. But for clear pictures, I’m not always sure how big they should be. I do the “medium” default a lot, too. I guess whatever looks best when you open your webpage and look at what the post will look like? Personally I always use a 300pixel wide image just for consistency. With an image that is too wide it is also a lot bigger in terms of kb. I try to get all post images to under 30kb. There isn’t a clearcut rule though as it can be related to how long it takes to download the rest of your site’s design. I am working hard on optimizing images. I have started using a few infographics in my posts, which are huge. I try to fix them up and download them to my own server before publishing them. Since I use a CDN, they will get cached and load even quicker. The only issue I have now is getting the image sizes in the code on some of my images. That has become a pain to do it automatically. Any suggestions Jeremy? There’s not a whole lot that can be done about infographics. They are going to be massive regardless how you deal with them. The best solution would probably be to use a thumbnail and have people click on it to see the full image. That way people aren’t downloading that whole image when they are on any page with an infographic. I can’t provide much help with automatically resizing or optimizing images since I personally do it manually. I personally use the photodropper plugin for my blog. I am sure it isn’t optimal but at least it allows me to put images in every post without a ton of effort! From what I can see on your blog, the image sizes seem decent. So I guess the plugin is doing it’s job. I might even have to try a plugin like that since it does take a bit of extra time to use Photoshop. I use the same plugin for my pictures. The convenience comes in really handy. Jeremy man, this is a great post! I take most my own pictures so linking to outside sites who might remove photos isn’t an issue. And actually, for images I have that aren’t my own, I didn’t even know you could just link up with the original website! So I guess that’s not aproblem I have. Andrea clued me into the smushit plugin, which I use, so that’s good — nice to see another endorsement! The file name thing, man, I always named my photos based on exactly what they are. Sometimes that matches the post name, sometimes not. Guess I should rethink that! Great tips, as always! Sometimes I name my files more directly to what the image is about, but if the post is targeting a specific keyword phrase, I try to slip some of those words in. It sounds like beyond image naming you were doing everything right. Taking your own photos is actually far more beneficial. Google can detect when an image is unique and may give extra bonus points to sites that have unique images. Good post Jeremy! I currently optimize, but my theme is having some issues with the images. I use GIMP to optimize them and the theme tries to then resize them which is slowing down my site. I’ve tried contacting the guy who made the theme and he won’t get back to me. We’ve decided to hire it out to a friend to figure out why the theme is doing this and hopefully stop slowing down the site. I had a similar problem with my theme before. Regardless of the image size, it insisted on trying to resize the images with html code. Eventually I got the problem resolved with the help of friend. It is best to avoid any image resizing within html. That kind of resizing often produces sub-par results anyway. Thanks to you I’ve learned to optimize every image that I have. I use a free tool called Gimp and I reduce the image size in addition to the image quality before uploading it to my site. I also use that Smush.it thing and it helps a bit more. I guess I should’ve mentioned GIMP in the post write-up. Since I haven’t used any of the automated plugins, I wasn’t sure what’s out there and what’s best. Glad to hear that combination is working for you. Since you have all those great shots from your camera, they do need to be optimizing for the web. Nice tips Jeremy – to optimize the images I’ve already uploaded I think it’s going to take a bit of time, but I’ll try and set some time this weekend to run through them all. I spent last weekend reading through SEO guides – and all of them mention that you should spend some time working on the title and alt attributes for your images, so I’ve been doing that! If only Google would hurry up and index my site! Thanks for mentioning alt attributes….yet another thing I should’ve mentioned in this post. Alt attributes go hand in hand with the image filename. Both should be used to reinforce which keywords are important for your post. I don’t really use title attributes much at all though. Those are a bit redundant unless they are used on links which you want to make relevant for different keywords than what is linked. If Google is taking time indexing your site, submit a sitemap to Google Webmaster Tools. Also try to get some quality links to speed things up. You might want to double check the W3C validation of your site and Google Webmaster Tools errors to ensure nothing is preventing Google from indexing. Thanks for the tips Jeremy. Already submitted by sitemap – and webmaster tools is showing just 1 missing url. The W3C validator caught me off guard – 51 errors and 4 warnings! Guess I have some research to do! ZAI was going to mention the ALT tags for images… Jon beat me to it. To cover all my bases, I always make my title and my ALT tag exactly the same. They are always very similar to the file name as well. And all of these include a target keyword. I regularly use the Upload from URL function within WordPress. Thanks to this post, I may have to re-think how I upload images. Definitely need to check out Gimp and SmushIt as well. Thanks man! No problem Matt. I didn’t even know wordpress had an upload from url function. That could be handy if it also allows you to rename the file and use it within the other plugins. Adding images is an area that I could stand to be a bit more efficient. Yeah Jeremy, on top of your image upload screen in WordPress there are 3 tabs. Upload from Computer is always open as default. Upload from URL is right next to that. I am uncertain now whether the file is actually uploaded to my server or if WordPress always loads the picture from its original location. I have to check into this and make sure it isn’t affecting the load time on my pages. To be honest I’ve never actually used WordPress’s upload feature. I’ve always just used FTP. Since I’ve always had to do that for other websites, it’s just what I’m used to. I use Wp.Smush It for my images. Sometime they are still WAY TOO BIG, but I’ve gotten better about that lately. And, by request of my wife, I’ve been naming the images the same as the blog post title, that way when she’s pinning it to Pinterest, she doesn’t have to do any renaming 🙂 Do you think that’ll get me the SEO benefits I’m looking for? Yeah that sounds good to me. I just checked your blog though. The main posts images look optimized but in your latest post you have some big images that are just scaled with html code. Those images really should be optimized too. We haven’t used WP Smush, but we do use Photodropper. Unfortunately, the plugin has issues occasionally, but it is simple. Hmm I’ll have to look into how serious those issues are. I’m tempted to use that plugin myself. I haven’t done much at all and didn’t know about that plug in, and I’ve still had some searches hit the pictures I’ve used . I will have to be more proactive with the images. Thanks again for the tips. I’d also look into the plugins mentioned in the comments above. It sounds like there is a variety of plugins for this purpose. First off, thanks for the mention Jeremy. I’m always trying to help out others when I can. I just wish I had more time promote others through social media. When it comes to optimizing images I usually don’t go any wider than 350 px. On top of that I also use a program called Irfanview which works great to optimize images for the web and it’s free. However one question I have is what file type is the best one. Is it better to go with .jpg or .png Any thoughts? I’ve never heard of Irfanview, but it sounds handy. If I wasn’t already in the habit of using Photoshop, I might consider using that. As for best image format to use, I’m not positive on the difference between png and jpg. I’d just compare filesize to see what works best. I tend to use jpg for all post images. If the image happens to have very few colors, then a gif is sometimes better. Excellent tips on images! Thanks for another great post. No problem Joe. Thank Anne for the great topic recommendation. Definitely going to have to go get that plugin! Do look into that plugin and the others mentioned in the comments. The right plugin would make it all so much easier. Good idea to watermark all your images to protect them. If I ever get around to taking my photos, I should try to remember to do that too. I like taking photos, but I never find the time to take the photos I need. So it ends up being easier just using free photos online. WordPress will take care of it automatically for in-post images, but always make sure the image dimensions are specified as well. I use the Zemanta plugin to find images. It is supposed to download them to my site, but sometimes it doesn’t. And Wikipedia images never seem to last long. I have to fix the image for the post I finished last night because Zemanta didn’t download it and it’s already gone! I wouldn’t count on wordpress to properly optimize images on its own. I suspect I can get a more optimized filesize via Photoshop or one of the plugins mentioned above. Another nice post on SEO, Jeremy! I wonder if title of the image is important from SEO perspective besides the file name related to key words. In my opinion it is a bit redundant to put the keywords in the filename, alt text and title. Maybe it’s worth testing though. Personally I just bother with the filename and alt text. I never thought of optimizing image name for SEO. I just had a standard number system to make it easier for me. Now I’ll have to rethink it. You’ve had so many great tips for me. I love this series that you do. I would recommend switching from your numbered system. You’re missing an easy opportunity to make your posts more relevant for your target keywords. Thanks for this – I really struggle with getting my images down to a good size because I have most of mine at 600px wide. This helps a lot – there is so much out there that I still have to learn. I’d say 600px is excessive considering how many kb those files would be. Sure it would look good, but it would be at a high price. The only way I’d consider that approach is if you were using a high speed CDN. Even then I’d be very careful to keep an eye on page load time. TinyPNG is a great online tool for reducing PNG files for web use. Giving correct credit to your images is always really important, so it’s worth checking what the attribution needed is before you use it. I think I used TinyPNG when I was optimizing my site speed a while back, but I generally don’t use png format images much. Out of habit I tend to use either jpg or gif depending on the image. Some bloggers don’t pay much attention to giving proper credit or they think that they can just give credit to any copyrighted images. They are just setting themselves up for unnecessary risk exposure. Same here Jeremy. I also use to use jpg images for better loading time. I heard a lot of sites like tinypng but never use them. But your post is just awesome. Image optimization is an important factor in SEO. Thanks for sharing it. Glad you like it Kathy. Search engines do take images into heavy consideration in their algorithms. So it is something that we shouldn’t be ignoring. Images are playing a bigger part of blogging, with themes that highlight the posts’ featured images becoming more popular, creating great visually appealing layouts. Even more so with the popularity of Pinterest and Facebook sharing, which uses an image from the page or post.Thanks for great ideas. Good point about how those post images are also used on social media sites and throughout a blog’s theme. Not only should those images be optimized for SEO, but also for better click thru rates. Those images can have a big impact on your visitors.